Pens Fatales: New Ebook Release! Emily Parker came to Dakota Territory to escape an unwanted suitor so the last thing she wants is to get married . . . and certainly not to the rough-mannered Drew Rutledge, whose illegal dealings with renegade Indians make him a less than ideal choice of husband. But when Emily's brother and Rutledge's adopted Lakota family team up in a matchmaking effort, the unexpected fire Drew ignites in her threatens to rage out of control, threatening her respectability. For all his strength and resolve to protect her, Drew can’t resist his feelings for Emily. As conflicts between the Black Hills settlers and the Lakota flare, Emily and Drew are caught in the crossfire. A secret marriage could save them both—or carry them into ruin. This week marks the ebook release of my first backlist title, a historical romance originally published by Avon Books in 1990. Now titled The Outlaw’s Secret Bride, it’s available as an ebook from Amazon, Barnes&Noble, and Smashwords. This is an unabashedly big romance from the heyday of the historical western. I tidied up some of the extra adverbs and adjectives, but as I read it through again I was pleased with how well it holds up—aside from that little problem with pheasants in Dakota Territory in 1880—WRONG, they weren’t introduced until 1882, and I do believe every single person in South Dakota knows that and made sure I did, too. I got it, folks. No pheasants this time. Still lots of meadowlarks and eagles, but no pheasants. 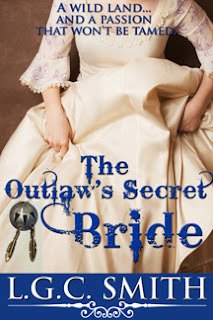 Writing The Outlaw’s Secret Bride was the most joyful thing I’ve ever done. I’d wanted to write since I was in elementary school. I’d tried lots of things. Poetry. Short stories. Literary fiction. Then one September night shortly after I started my doctoral program at Cal, I couldn’t sleep, and I found a historical romance on my mother’s coffee table. I devoured it. I’d read romance in college, then stopped, mostly because I lived in Switzerland and was so poor I couldn’t buy many books. I read what my friends passed around. There weren’t a lot of romances in the mix. As soon as I finished reading that big historical, I knew what I was going to write. I lugged three giant backpacks into the stacks at Cal and gathered enough books and journals to damn Bear Butte Creek in a rainy June. I spent most of that semester researching and plotting. I don’t know how I got any course work done, but I did. I also read every bestselling romance I could get my hands on and analyzed the stories and the language. By winter break I was writing. By the end of March, I had a 150K draft. There were days I spent ten hours in a folding chair at a kid-sized desk in a dumpy family-student housing apartment, and never took my head out of my story or my eyes off the tiny screen of my Mac SE. I didn’t eat. I lost track of time. For me, that was unprecedented. I loved this book. I loved writing it. Some might quibble with my stylistic choices, but I made them carefully. Every freaking word. I didn’t take no for an answer until I got an agent (not a great one, as it turned out), and then an editor (who was pretty great) and a publisher, and I have been writing romance ever since. The small flags of colored cloth snapped against their poles like wild ghosts in the night as the west wind lifted them. The wind brought the scent of new grass, damp earth, and promised rain, yet there were no clouds. A waning crescent moon dipped toward the horizon, and the boy sitting on a bed of sage, enclosed by the four poles, shivered as the breeze rippled over his bare, sunburned body. Goosebumps rose on his arms and stomach, but he didn't notice them. His eyes were fixed on a small, dark speck far away in the western sky, beyond the pale buffalo skull atop the cottonwood pole before him, beyond the dark humps of Mato Paha, or Bear Butte. Without blinking, the boy lifted the pipe that rested in front of him and raised it to the four winds, to the earth and the sky, and finally to the dark shape approaching him. He stood motionless. Tiny sounds began to fill his ears, growing until they were almost deafening in the predawn stillness. He heard the grass stems bending and shifting in the wind, and the insects marching upon the moist spring earth. He heard the horses at the camp whinnying and snorting. And though the camp was far from him and beyond his sight, he heard the even breathing of the sleeping people, the small cries of babies, the snores of old men, and the creak of the lodge poles in the gusting wind as if he were present in each lodge. The sounds spilled into the night. Then there were new voices, and harsh, metallic noises coming from the east. Noises he remembered from his childhood encroached on the prairie night: crowds milling, engines churning with cranking gears and hissing steam, wheels screaming against steel tracks, and heavy wagons thundering over uneven roads. The roar built in his ears until he could no longer hear the earth and the people, but only the chaotic din of machines and white men's shouting voices. Suddenly, the rush of beating wings drowned out all other sound, and the boy stared in wonder as the dark shape above him descended, wide wings blocking out the stars. Instinctively, he held his pipe aloft, and a sob escaped his lips. Tears streamed down his face, and he thought he would faint from the excitement and fear that coursed through him. Then the great bird dropped onto the buffalo skull and looked curiously at the boy. It was an eagle, strong and powerful, his dark feathers touched with lighter spots that glinted in the faint moonlight. The boy ceased trembling and forced himself to meet the eagle's gaze. Should he ask a question? Overwhelmed, he waited, saying nothing. The eagle continued to regard him. Finally, the boy felt words forming in his mind and heard his own voice in the silence. "Welcome, Tunkaśila, Grandfather. I am honored that you have come. What can I, a man born to the white eyes, learn from you, Wambli Gleśka, the Spotted Eagle?" As soon as he had spoken, he wished he hadn't. He sounded so young, so weak. But the eagle seemed pleased and answered the boy. "Wakantanka, the Great Mystery, knows you, Iśte Śkan Niyapi, you who have eyes that are alive with the sky, and I have come as a messenger. I will show you things you will need to know to serve the Lakota. Come with me." The words died away, and the boy felt himself drawn up into the air with the eagle, sweeping ever higher into the night sky, until he thought they would brush the very stars. High and far they flew, into the east. The boy saw the great rivers below them shimmering like ribbons. As the sun lifted over the distant horizon, throwing a pale yellow light into the sky, they reached a land of rolling hills and low mountains covered with dense forests. Among the trees were farms and fields, and along the rivers were towns, white people's towns, and many, many white people. The boy had seen these places years ago, when he had traveled through them with his father, before they had met the Oglala. Yet something was different about the hills and towns. Looking closely, the boy saw an ugly pall of smoke overtaking the land and flashes of fiery light glinting red through the trees. The eagle drifted downward on the wind currents, and soon the boy heard terrible sounds. People were crying everywhere, and explosions and gunfire erupted all over the land. Then the noises faded, and he and the eagle kept flying toward the east, finally reaching a city that the boy recognized as the place where the White Grandfather lived, the laws were made, and the white councils met. He had visited this city with his uncle once when he was very young, perhaps five or six. It seemed very strange and frightening now. He wondered why the eagle had brought him here. In answer to the boy's thoughts, the great bird swept low over the city, so close that they could hear people talking. There was talk about the war, and about the need for land, more land in the west. People talked of cattle and railroads and gold. And they spoke of the Indians. The boy listened hard to hear what was said about the Indians, and his heart grew cold at the words he heard. Savages. Animals. Murdering heathens. Let the army take care of them after the war is over. They're sitting on land we need. Push them off. Eliminate them. Make room for good Christian people. The boy was ashamed that he was of the same race as these callous men, and he was shocked by their ignorance. Indignation and fear burned his spirit. Their own country in war-torn ruins, they calmly spoke of taking the Indians' country and carrying their ugliness onto the plains, bespoiling them forever. There were men who defended the Indians, but they were few, and even they did not seem to understand the horror of what the others said. Then he heard the eagle's voice in his ear. "You will be able to help the Lakota. You know this world, and they do not." The eagle bore him high above the city again, and they turned back toward the west. The boy thought about what the eagle had said. He didn't feel as if he knew this world at all. He knew the prairies and hills of Dakota and the Powder River country. He knew horses and hunting and how to survive on the high plains. He had been a child in the white man's world, but he didn't know it any longer. He was becoming a man in the world of the Lakota, and he was happy there. He didn't wish to return to his old life. Would he have to? Was that what Wakantanka wanted him to do? The dawn caught them again, and the eagle carried the boy back and forth above the earth between the Missouri River and the Bighorn Mountains. He showed the boy the bands of people traveling with their horses and their travois from camp to camp, from south of the Platte River to the Canadian border. The land was wide and lovely, full of game and wild fruits and herbs. Buffalo blanketed the prairies, moving like a dark cloud through the broad valleys and across the hills, and the people were happy. But each time the boy and the eagle crossed the land, they didn't go as far as they had the time before. Soon they didn't go as far south as the Platte. They didn't go as far west, or north or east, either, and the people didn't travel as much from place to place. There were large camps along the Missouri that never moved, and the people were not so happy. The buffalo and the other animals began to disappear, and the people grew weary. When the boy and the eagle flew only between the Black Hills and the Missouri, the people were starving. Then the boy caught his breath. There were white people in the Black Hills. The Lakota were being chased away, sent to the river to die of white men's diseases and grief. Everywhere now there was the sound of mourning. Hunters returned with empty hands, and children and old people cried because their stomachs were empty and their hearts remembered better days. The land itself sighed with sorrow for the people and all the relatives, the buffalo, the elk, the birds, and all who were disappearing. The eagle flew back toward the Hills, where the boy saw a single buffalo cow below on the prairie, trotting toward the Hills. The eagle followed it. The buffalo picked its way through the trees, sometimes lost to sight in the narrow gulches it followed. After a long time, it disappeared into a thick grove of pines and spruce beside a meadow and did not reappear. The eagle soared above, and the boy looked down on a small waterfall and a pool. A tall pine rose like a spire next to the falls. The eagle glided down to perch in its uppermost branches, and they waited, looking for the buffalo. It was so beautiful and peaceful in the meadow that the boy forgot the suffering he had seen. There was a sudden movement below. The boy and the eagle looked down immediately, but instead of the buffalo, a woman walked from beneath the trees. At least the boy thought it was a woman. He couldn't see her clearly; a cloud of mist from the falls obscured her from view. The eagle lifted his wings, and they dropped to the earth before the woman, yet still the boy couldn't see her. Then the mist cleared, but only for an instant. All the boy saw were her eyes, the most beautiful, mysterious eyes he had ever seen, as brown as the moist earth below his feet, and as green as the dark pine boughs above him; eyes that beckoned him with expectation and the warm promise of invitation. His heart leapt into his throat as he instinctively reached toward her, his hand grasping for hers through the tattered wisps of clouds and fog. Then the mist wrapped around her once again, as quickly as it had cleared, and he felt the powerful thrust of the eagle's wings as they rose into the air together. He strained his eyes, hoping for another glimpse of her, but he was too far away. She was gone. Soon he saw the familiar shape of Bear Butte below, and he was falling, falling back to the ground, back onto the bed of sage within the square marked out by the four poles and colored flags. He hit the earth facedown and knew no more. You paint such a beautiful, haunting picture of the world then, even more heartbreaking because we know how it will end for the Lakota. Thanks, Toni. :) Harper/Collins was quick and efficient about confirming the reversion of rights. Gigi designed the new cover. Martha, Lisa, Adrienne and Rachael all helped directly in so many ways I can't count them all. Sophie, Julie and Nicole encouraged and inspired me. I'd be lost without the other Pens and our friends here. Things haven't ended for the Lakota yet. They changed. Abruptly and with shocking ugliness. But as a people, their stories are far from finished. Their language and culture survive. And I never worked with smarter, more articulate and critically astute college students than on the rez in South Dakota. The kiddies at Cal and Penn, while lovely, were no match. I'm reading - and loving - this now! Thanks for writing it. p.s., Where have all the Pens Fatales gone? I miss their posts. Happy Mother's Day from the Pens Fatales!